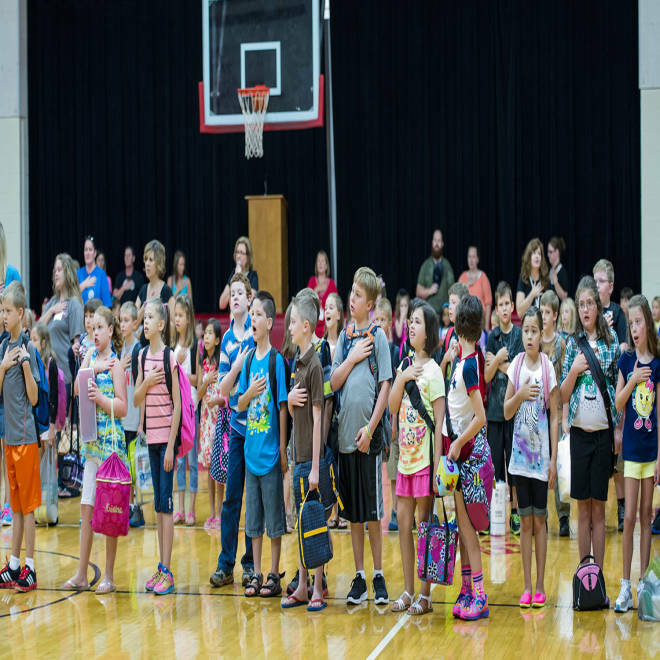 Burgin Independent students in Burgin, Ky., recite the Pledge of Allegiance of the United States Thursday, Aug. 1, 2013. The presence of the Almighty in the Pledge of Allegiance has resisted numerous challenges over the years, and a lawyer who intervened on behalf of a family in a suburban Massachusetts school district doesn't expect that to change with a new challenge. A ruling to strike out the phrase "under God" in classroom recitations of the pledge on equal rights grounds "would represent a major break with federal law," said attorney Eric Rassbach, who is representing a family that would like to have their child continue to say the pledge every day without any changes to the wording. The deputy counsel of the Washington, D.C.-based Becket Fund for Religious Liberty, Rassbach described himself as a Presbyterian, and said he doesn't remember saying the pledge in middle or high school. The Becket Fund has represented members of many other religious groups in the past, as well as atheists, he said. "Nobody has to say the words 'under God,' or the pledge at all," said Rassbach. "That's an extremely important thing that most people don't realize. You can't compel people to say the pledge, and if someone was compelled to say the pledge, I'd be on the other side of the case." The suit filed in Massachusetts may offer a new challenge to the pledge – the anonymous plaintiffs claim that the phrase is a violation of Massachusetts' equal rights laws – but the idea of standing up in front of a flag and saying words to it has incited controversy for most of the pledge's 120-year history. The pledge, published in 1892, was first challenged on religious grounds in 1943, before the reference to God was even written in. That year, in West Virginia State Board of Education v. Barnette, the Supreme Court ruled that students could not be compelled to salute or say the pledge in classrooms after a Jehovah's Witness refused to participate at school. The pledge went for another decade without reference to the godhead until the early 1950s, when the Knights of Columbus began pushing at annual meetings to have the phrase added for general recitation. Lobbied by groups including the Knights, Congress passed a joint resolution in 1954 that inserted the phrase, with the approval of President Dwight Eisenhower. "These words will remind Americans that despite our great physical strength we must remain humble," Eisenhower wrote in a 1954 letter to the Knights, thanking them for their contribution. "They will help us to keep constantly in our minds and hearts the spiritual and moral principles which alone give dignity to man, and upon which our way of life is founded." The sponsors of the 1954 bill signaled their anticipation that other people might be less enthusiastic about the addition to the pledge, saying that, "A distinction must be made between the existence of a religion as an institution and a belief in the sovereignty of God." "The phrase 'under God' recognizes only the guidance of God in our national affairs," they said. An attorney who is representing the Massachusetts family that wants to strike the phrase said in the state's Supreme Court on Wednesday that the words, when recited in classrooms, "validates believers as good patriots and it invalidates atheists as non-believers at best and unpatriotic at worst." Among the most successful challenges to the pledge in public schools to date was a suit that rose to the Supreme Court in 2004. An atheist, Michael Newdow wanted to sue to ban the pledge from his daughter's California school, but the court ruled that the father, who was in the midst of a custody fight, could not do so on his daughter's behalf. The 9th Circuit Court of Appeals had earlier ruled in Newdow's favor, calling the contended phrase "an endorsement of religion." A steady beat of bills, legislation, and lawsuits related to the pledge has continued since, including, in 2012, a Michigan law that required public schools to give students a chance each day to say the pledge – but not requiring students to participate. Michigan was just catching up with the rest of the country by passing the law, joining at least 37 other states that place similar requirements on public schools, according to the National Conference of State Legislatures. NBC News' Sophia Rosenbaum contributed to this report.